Every retailer with multiple stores struggles with the cost and logistics of training in-store staff, delivering corporate messaging to manage the business culture, and promoting new product offerings to its captive customers. With ever evolving products and a transient workforce, it’s almost impossible to grow your business. StorePOINTE is a revolutionary new solution that breaks through all of these barriers. And at any time, staff can play a training module, a safety seminar or even a recruitment video, on demand. You can play these modules on an in-store display, or view them wirelessly with your iPad or other mobile device. With all this power, StorePOINTE is incredibly simple to setup and operate. 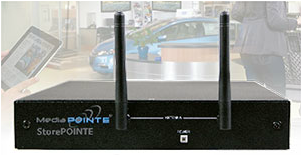 The StorePOINTE player is a small box that simply mounts to the back of your in-store display. In your main office, a MediaPOINTE DMR automatically distributes content to your stores, updating them daily with the latest content. It even reports which stores have taken which training modules and how frequently … all automatically.